I am always packed for the Camino. It’s been only a week since I came back home from my tour of duty as an Amigo – an English speaking greeter in the office of pilgrims in Santiago de Compostela – and I am already looking at airfares and deciding what I still need to buy. How is it that a kid from the Midwest could become so taken with the medieval pilgrimage to the Cathedral in Santiago de Compostela? The pilgrimage goes back over a thousand years, but I only learned about it in college, in my Romanesque Sculpture class at the University of Michigan. I studied with a woman who was, at the time, emerging as one of the brightest lights in art history scholarship. She spent her career exploring the intricacies of one Romanesque cloister in southern France along with several other key topics, not the least of which is the identification of the “Seat of Wisdom” depiction of Mary with a seated Christ on her lap. She was inspirational and she taught us that there was this road that had been traveled since the time of Charlemagne, pulling artists and poets and musicians to walk across France and Spain with the sole object of paying their respects at the church in northwestern Spain which holds the remains of the apostle James. It took me a while to get there, decades actually. First, I didn’t have the money. Transatlantic travel is still not cheap. Then, I didn’t have the time, what with a job and then children, family responsibilities and all. And I kept saying to myself that I didn’t really want to go walking in Spain by myself either. So months went by, years went by, and I never got there. It was there. I wasn’t. In 2010, I read about the celebrations of the Holy Year. That is the calendar year when June 25, the Feast of Saint James, falls on a Sunday. James is also the patron saint of Spain, so this is a really big event. 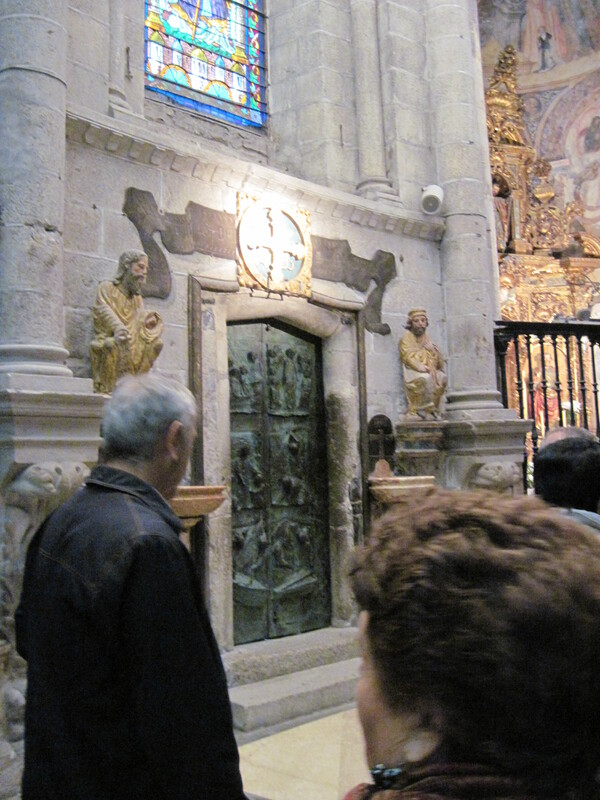 The year begins by opening the Holy Door of the Cathedral, La Puerta Santa. It’s a special door that opens only during that year and is closed again on New Year’s Eve. Anyone who wishes to use this special entrance to the Cathedral can do so by simply waiting in line outside, and I knew if I missed it, I would have to wait until the next Holy Year – 2021. I decided this was my moment. I made the leap by buying a plane ticket and putting in for my vacation. I had little real walking preparation and I decided I could in fact walk by myself so I booked my trip over Christmas and I walked. I even managed to squeak through the door about an hour and a half before it closed. I watched the fireworks through the skylight in my hotel room, just up the block from the Cathedral. It was extraordinary. Two years later, I walked again with my daughters. We spent Christmas Eve up in the mountains, eating paella and listening to American Christmas carols on a laptop plugged in near the kitchen of the hostel where we stayed. When we got up the next morning, the man who ran the hostel took me outside to show me we had a white Christmas, just like in the song, and we walked all day surrounded by snow. Everyone talks about how walking the Camino changed their life, but I don’t think that’s a fair assessment of how it has affected me. Rather, it is the amplification of my life, the display of my life. I have been able to speak with dozens of pilgrims and people who want to become pilgrims and I tell them stories and give them tips about what to bring, what to leave at home, but in the end, this road is best traveled alone. Even when you go with other people, as I have, it’s best to do it for yourself. I met a wonderful man while I was working in the pilgrims office who told me he had made the journey several times, once walking to Santiago de Compostela – in northwest Spain, remember – from Jerusalem, stopping first in Rome. When I told him that was incredible, he shook his head and said, “No, it’s just walking,” as if that were the simplest thing in the world to do. In the end, he was right. One foot in front of the other, over and over again. It’s less about training and all about motivation.